Dreamt of being your own boss? We're looking for passionate people with a love for life to join our family! 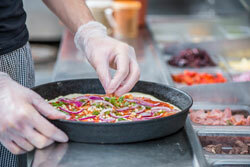 We wanted to give the people of Brisbane the chance to enjoy an interesting and varied menu, with pizza made using only fresh restaurant quality and wholesome ingredients. It was a hit. We were a standout, and as word spread the store got busy...really busy. After the first year in market a second store was opened in the inner Brisbane suburb of Toowong. Just like our first kitchen in Kenmore, the Toowong store struck a similar chord with the locals. For the next few years we knuckled down and further developed the menu, concepts and systems. By 2002, with solid foundations built, we added more stores to our growing family - and as 2005 came around we had a dozen kitchens under the Pizza Capers flag. 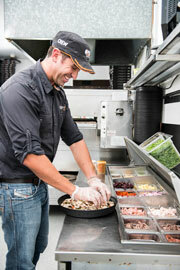 2005 was also an exciting moment for all those involved and an important milestone for the Pizza Capers brand. With demand and popularity for our pizzas continuing to grow, we welcomed our first franchisees to help open more stores to satisfy the many mouths wanting Capers. How much does a Pizza Capers franchise cost? Pizza Capers also offers tailored purchase packages to suit your needs and budget - be your own boss! For more information please contact us via the form below!